Ahhh I'm so excited to share this with you all! After years of posting about tattoo inspiration on this blog I finally went and got my very own baby tattoo on Friday, after finishing my first year at university. I'm so so happy with how my little crescent moon turned out and thought I'd do a post to answer any questions you all might have. Since I first started university I've wanted to get a little tattoo as a memento for my first year at university and my first year living in London. 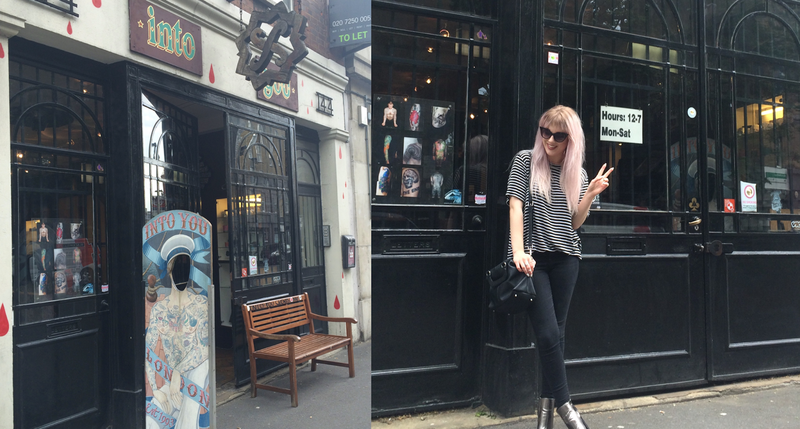 A while ago I googled 'best tattoo parlours in central london' and discovered Into You, a shop that's less than 2min away from my flat and that I walk past every day to get to university. If that hadn't convinced me enough, this place has an amazing reputation and was where two of my life-long idols/obsessions Alexander McQueen and Britney Spears got some of their tattoos done. The meaning of my tattoo is as much about where I got it done as the symbolism of the design, it seemed to all slot together perfectly and I knew that Into You was the place for me. This wasn't something that I'd worried about at all, right up until the gun started going and then I wanted a friend to hold my hand! The pain was nowhere near as bad as I expected, feeling like a cat-scratch in most places and in tender areas, more like a burn. My tattoo was done in super short bursts though, so as soon as I started to really feel it, she would stop, adjust the position of my arm and start again. All in all the pain was not at all unbearable, considering the inside of the elbow is supposedly a tender area to get tattooed. It was over in about 5-10min and in the grand scheme of things, it really wasn't bad. Why that tattoo and why that placement? I'm not going to go into all the ins and outs of why I got a crescent moon, but it's a design I've had my heart set on for a long while now and there's a lot of meaning attached to it. I chose the placement because I wanted a tattoo that wasn't overly visible, but that I could choose to show or that people would get a glimpse of without me having to take all my clothes off. When my arms are flat to my side you can't see it, it's only when I move my arms that you can catch a glimpse. Plus, the location is a bit unusual which I like because of how simple the tattoo is. I'm really, really pleased with the job that Emily from Into You did. She was such a perfectionist, touching up the lines with a super tiny needle even when I couldn't see any faults (and I'm pretty picky). With the placement in the crease of my elbow and the tiny design, there was a lot of room for error but Emily was so delicate and the lines are so sharp. 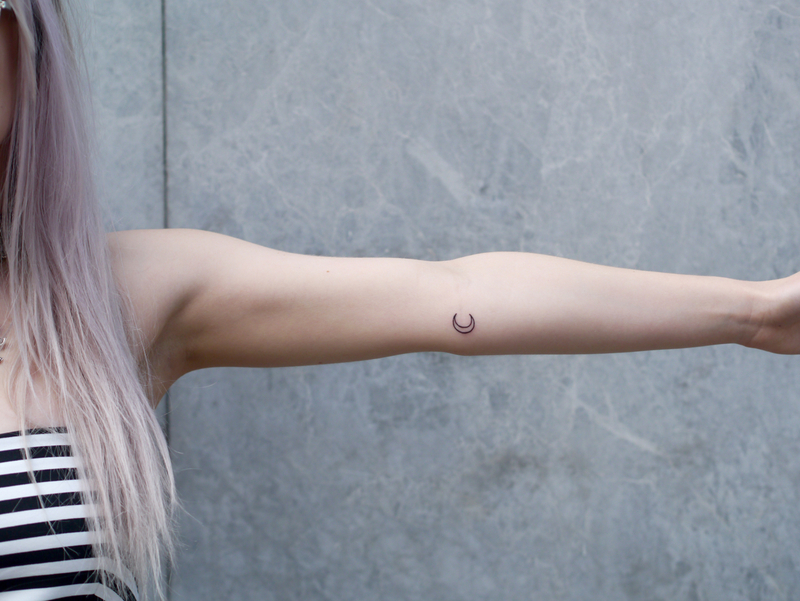 The moon is also perfectly symmetrical so that when I bend my arm, the points join up to make a loop. I'm so excited that I finally got my little tattoo! I hope you liked this post! I've been so excited to share this all with you! I love this, such a cute little design and great placement! wow, this is absolutely perfect!!! What a cute, dainty tattoo. I love it! Such a cute little tattoo! So cute, love the placement! Simple, and beautiful! Love the placement. I have a constellation just under the fold on my arm!